If anyone ever tells you a car cannot be happy and cheery then you need to point them to the Renault Clio and prove them wrong. With a super compact design and sleek curves this is a mini that is full of power and style! Its great for fuel efficacy and has advanced safety features that will keep you and your passengers safe, wherever it is you are heading. There is room to seat 5 comfortably in this compact package and with a convenient 5 door design, you will have no problem getting yourself and your belongings in and out either. You can enjoy a stunning 3.8 L/100km or 60.4mpg fuel efficiency and the safety features you want like ABS, airbags, and more. 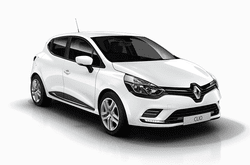 Check out the Renault Clio now!